In our job research we see many unusual ways that home-based workers are earning income. Here are 10 from the current files. Virtual Vampire – It’s not often you can get paid to be a vampire. Second Life has several fangy jobs. Search the job board with keyword vampire. Professional Snuggler – It sounds a little creepy, but if you don’t mind cuddling up with a stranger — a big if — you can make $80 an hour and $400 a night as a professional snuggler. You keep your clothes on, snugglers say; this is Safe Spooning. Sites like Cuddle Comfort match snugglers and snugglees. For more, see this Wall Street Journal article. Professional Bridesmaid – Many brides would like to have bridesmaids who could “do anything” to make the wedding a success. Jen Glantz at Bridesmaid for Hire reportedly charges $199 to $1,000+ with several options: “Everything from hiring us just virtually, to having us there behind the scenes – making sure you and your bridesmaids have everything they need, to hiring us to actually stand up there with you at the altar.” And she does the Electric Slide, too! Professional Mermaid – What little girl hasn’t wanted to be Ariel, one of the great Disney princesses? Professional mermaid Melissa Dawn, aka Mermaid Melissa, actually prefers Jacques Cousteau to Ariel, but otherwise she’s crazy about water. In her performances at aquarium shows and poolside parties, she wears a 60-lb. silicone tail and can hold her breath for five minutes. Professional mermaids are reportedly in high demand, and can make $250 an hour at children’s birthday parties. For more, see Inside the Mermaid Economy. Rent Your Clothes – If you’re working from home, your wardrobe may run more toward PJs and sweats, but there might be something at the back of the closet… A strapless floor-length dress can rent for $700 a month…. Check out the options at Loanables.com. Fortune Cookie Writers – Got a flair for phrases? About 3 billion fortune cookies are made and eaten in the world every year. Each one needs a “fortune” inside, so that’s a lot of phrases! Writer Russell Rowland made 75 cents a fortune back in 2000, using reference books to help. But the big cookie-maker, Wonton Food, has 10,000 fortunes in its database, so you’ll have to think hard! For more, see this Guardian article. Get Paid to Write Lists – Some people love list-making. They think of lists, they write lists, they live lists. If you like lists, and don’t mind a little research to flesh them out, bam, get $100 from ListVerse. Make Money Writing Slogans – If your fortune-cookie phrases don’t make the cut, turn them into slogans and send them to Ephemera. They’ll pay you $50 for each one they take. Make Money with a Drone – Drones are all the rage now. Toy drones, camera drones, racing drones… A few hundred dollars and you’re flying. Don Gottlieb makes $175 an hour with his, filming weddings, real estate, yachts… You’ll need an FAA permit for commercial use. More on that here. 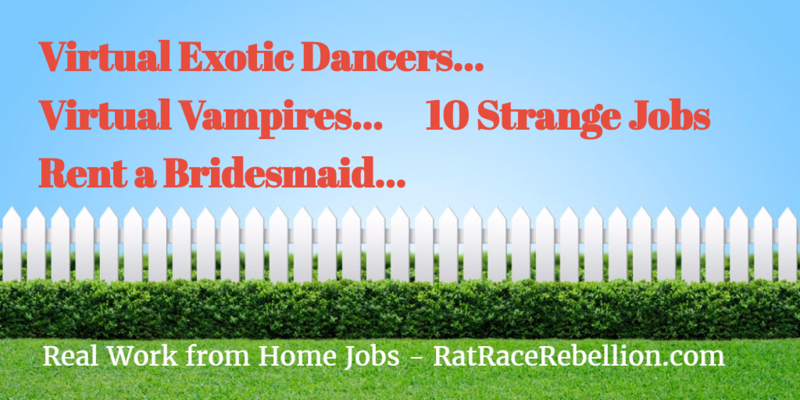 This entry was posted in Earn Extra Cash, Home-Based Businesses, Non-Phone Jobs, Weird Jobs, Writing & Blogging and tagged Professional Snugglers, Virtual Dancers, Virtual Vampires. Bookmark the permalink.